I have a very specific question for you today: have you read “The Hunger Games” trilogy? Because I liked the movie a lot and have been thinking of reading "Catching Fire" and "Mockingjay" and would love to hear the opinion of those who have read the books. Would you recommend them? I wonder if these books would grab my attention the same way the Millennium trilogy did. These were my third attempt at raspberry muffins: before them I’d tried a recipe by Donna Hay and another by Alice Medrich, but both were disappointing. Cindy Mushet's , however, are perfect: delicious, tender and the raspberries don’t get mushy in the batter. Preheat the oven to 190°C/375°F. Butter a standard 12-cup muffin. Whisk together the flour, ⅔ cup (133g) of the sugar, baking powder, baking soda, and salt in a large bowl. In a medium skillet, melt the butter with the lemon zest. Turn off the heat. Add the buttermilk and let it sit for 1 to 2 minutes, just until it is tepid. Pour the liquid into a medium bowl, and add the eggs and vanilla. Whisk until well blended. Make a well in the center of the dry ingredients. Pour the liquid ingredients into the well then stir into dry ingredients just until combined – do not overmix; batter should be lumpy. Gently fold in the raspberries until evenly distributed. Divide the batter evenly into the prepared muffin cups. Stir together the remaining 1 tablespoon sugar and the cinnamon and sprinkle it over the tops of the muffins. Bake for 18-20 minutes or until the tops feel firm and a skewer inserted into the centers comes out clean. Transfer the muffin pan to a rack and let cool for 5 minutes. Gently run a knife or spatula around each muffin to free it from the pan, lift the muffins out, and transfer them to the rack to finish cooling (careful, these are tender while hot). Serve warm or at room temperature. I've read the first and it was AWESOME. I'm definitely going to read the other two. Also: I watched "Drive" a few weeks ago. SO much more violent than I expected! Loved the end. Definitely read the books! They're really fun (and somewhat thought provoking, if you want them to be), which makes for a fast read. I am also interested in starting the series so all these comments are helping me too :) I LOVED the Millennium trilogy!! Yes! Read the books! They are GREAT -- the 3rd was my least favorite. Not great hallmarks of literature, mind you, but very much like watching a movie while watching a book! She plots very well. Quite fast paced and exciting, I think you'll like them! The movie was great but could have been...more, I think they glossed over some of the more intense details. THESE MUFFINS! Cannot wait to try! Please do read Mockingjay and Catching Fire-- like, immediately. So good. I loved them both. 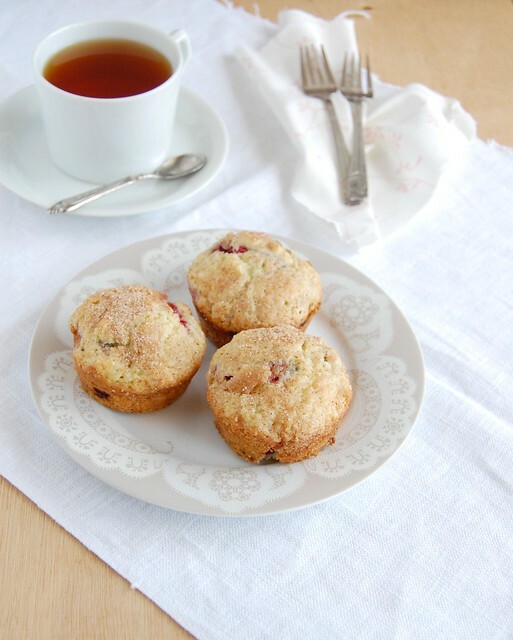 Your raspberry muffins look so good! Love the addition of cinnamon. Girls, thank you for your comments! I'll read the books and then let you know my thoughts. Oh yes definitely read the book. The book is a little different than the movie so I really think you will enjoy it. Hey, Cat, tks for your comment! I'll buy the books asap! I read all three (I can't help but finish a book, even if I hate it) and honestly, I didn't care much for them! I liked the first one enough, but I was really annoyed at how the whole Peeta thing was handled. As a major plot point, it just annoyed me and felt so thin. The second was not quite as good to me, but still had some parts I was interested in, but the third was actually pretty boring to me. I dunno, maybe I'm the crazy one though because everyone and their mom seems to love them so much! Oh, Margo, I'm sorry the cinnamon was too much for you - not all the muffins have cinnamon, you can make them without it, no problem!